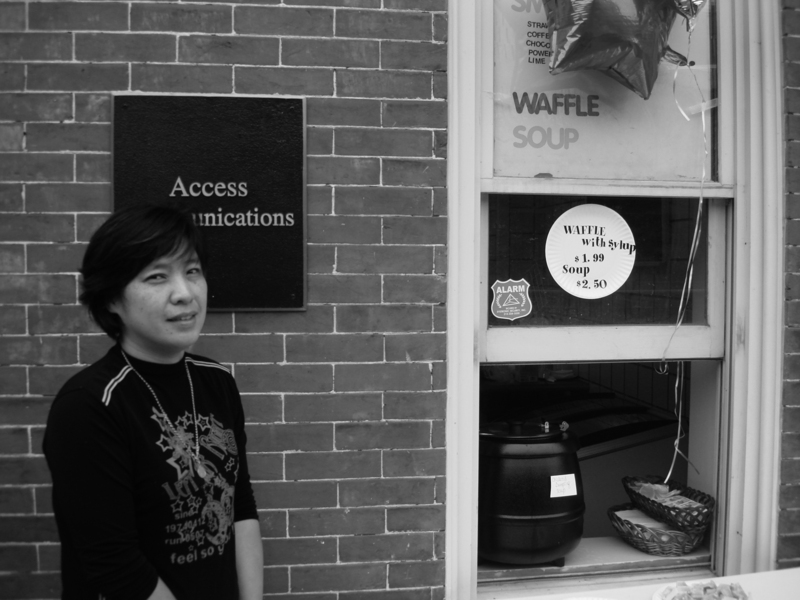 YON KIM, a South Korea native and mother of a Temple student, has been managing the T-Mobile store on Liacouras Walk for eight years. Recently, she made the change to a waffle, soup and smoothie shop. GREG TRAINOR TTN Yon Kim, a South Korea native and mother of a Temple student, has been managing the T-Mobile store on Liacouras Walk for eight years. Recently, she made the change to a waffle, soup and smoothie shop. The Temple News: You’ve been in America for 14 years. Have you been in Philadelphia the whole time? Yon Kim: No. In the beginning I moved to Southern California. One and a half years later, my husband got here [to go to the University of Pennsylvania]. That’s why we came here. [We’re] going back to California in the future, pretty soon. TTN: How long have you been making waffles? YK: Two months, but [I’ve been in] the same place eight years with the landlord. Actually, this building belongs to Temple. Temple needed a convenience store for students, and they tried to decide to sell these two buildings to the developers and they remodeled. The landlord decided for me to change to some kind of food [business]. In the beginning, I asked them [to place a] sushi place in here. [But he suggested] something like ice cream, smoothies or soup. That’s why I made the change. I just started last weekend. I didn’t get the license yet. I have a temporary license, and then we’re going to have a grand opening. TTN: Is it a breakfast shop, or is it open late? YK: It’s not a breakfast shop. The winter menu is soups and some dumplings. [During] summer, we’re going to [have smoothies], and you know the bubble teas? TTN: How do you feel about living in the U.S.? YK: I have two boys. They have all grown up here, so I’m fumbling with the future. [There’s a] chance that I’m going to go back and visit a little bit. It’s been five years. I didn’t get a chance yet because I have two college kids. I’m pretty busy. TTN: What do you think about Philadelphia? YK: I like it. The weather is exactly like my country, four seasons, and the winter time [brings] a lot of snow and cold, and summer is hot. I’m familiar with this area, so [I like a] lot of things actually. TTN: What do you like about Temple? YK: Students. They are friendly with me, and North Philadelphia [is a good area] because Temple is really nice. Traffic [makes it] really hard to hear on North Broad Street. Besides that, I’m really happy with it. Anchor opens up TUTV broadcast to a non-English-speaking audience.